Honeysuckle (detail), design registered 1876. 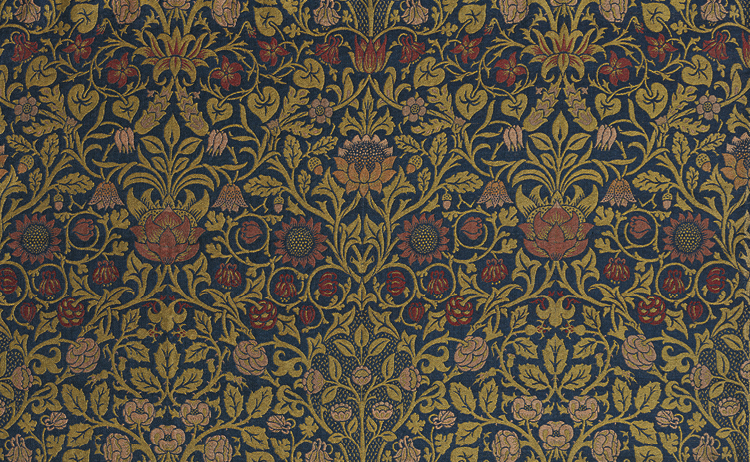 William Morris (British, 1834–1896). Linen, bleached: plain weave; block printed; 84.5 x 90.5 cm. Gift of Mrs. Henry Chisholm, 1937.697. In the spring of 1876 the energetic designer William Morris wrote to his friend Aglaia Coronio, “I am drawing patterns so fast that last night I dreamed I had to draw a sausage; somehow I had to eat it first, which made me anxious about my digestion: however I have just done quite a pretty pattern for printed work.” (1) Morris was in the midst of one of his most productive periods of textile design, and while we do not know which work this anecdote refers to, it was the year he designed Honeysuckle, an archetypal pattern that shows his love of large mirror motifs. Morris was a poet, craftsman, designer, novelist, businessman, and social activist whose cause of death in 1896 at age 62 a doctor attributed to “simply being William Morris, and having done more work than most ten men.” (2) The decorative arts firm Morris, Marshall, Faulkner & Co., founded in 1862 and reconstituted as Morris & Co. after 1875, designed and sold household furnishings that were sought after for their elegant, colorful patterns and high-quality materials. Morris insisted on producing goods made under fair labor conditions, which set him apart from many Victorian manufacturers for whom industrialism meant imposing grueling hours and low wages on workers in dangerous factories. Textiles—including embroidery, printed cotton, woven fabrics, tapestries, and carpets—were among the most profitable of the company’s merchandise. 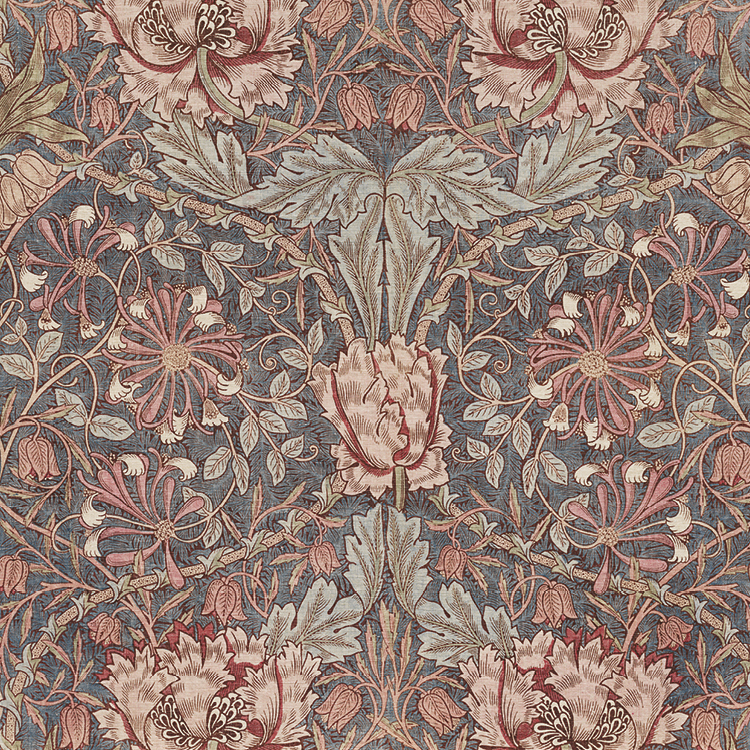 Morris was a born pattern maker and looked to both nature and history as a model. Unlike German and Japanese textile designers, or his English competitors, he was inspired not by exotic greenhouse flowers but by the simple blooms of an English garden. The humble marigold, honeysuckle, tulip, and sunflower often joined tangled ivy or sprigs of willow in patterns of great clarity and charm. During an age when rooms were stuffed with mass-produced objects and teeming with ornament, Morris challenged people to “have nothing in your houses that you do not know to be useful or believe to be beautiful.” (3) Throughout his career, however, there was a tension between Morris’s desire to make high-quality goods widely available and the expense of producing handcrafted items from fine materials, which meant primarily the wealthy could afford them. One of his costly innovations was to return to the natural dyes that had been replaced during his lifetime by garish and fugitive chemical dyes. Evidence of the rich and subtle hues of natural dye is apparent in textiles such as Violet and Columbine, woven from wool and mohair. The installation of the exhibition William Morris: Designing an Earthly Paradise reflects the character of many Victorian rooms that incorporated products designed by Morris & Co. Richly varied patterns on fabric, wallpaper, and carpets produced a vividly lush effect. The gallery walls are papered with a modern reproduction of Fruit, one of Morris’s earliest wallpaper designs, dating from 1862 and in production for over 150 years. Created with generous assistance from the Victoria and Albert Museum in London, the rug is a full-scale reproduction on vinyl of Bullerswood, the largest hand-knotted Hammersmith carpet (so called for the district where they were originally made) ever produced by Morris & Co.
From Morris’s university days at Oxford through the end of his life, he relied on the camaraderie of friends and family to foster the creative environment in which he delighted and thrived. This was especially true of his final labor of love: Kelmscott Press. Founded in 1890, the press produced beautiful books with ornaments and typefaces designed by Morris. The volumes had much in common with books printed in the earliest years of the printing press. Bound in either vellum or quarter-cloth and paper and printed on high-quality linen paper, they underscore the tactile experience of reading. 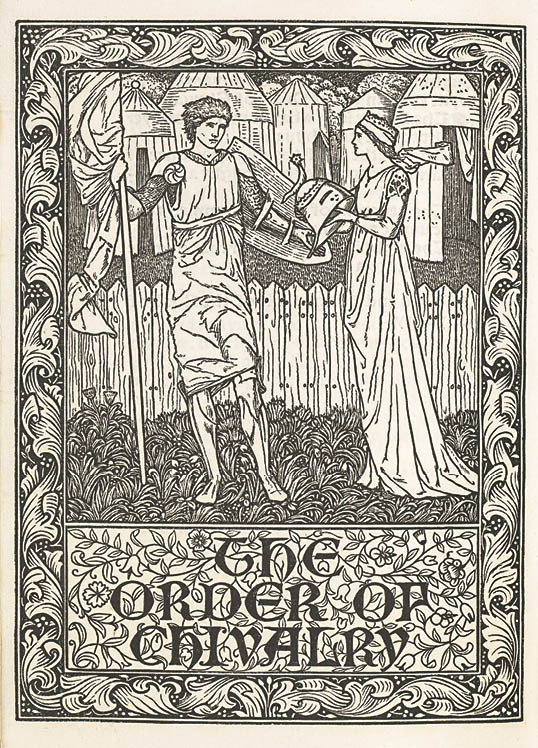 Several books were illustrated by Morris’s friend Edward Burne-Jones, a successful painter who also designed stained glass and tapestry for Morris & Co. Burne-Jones’s illustration for the frontispiece of The Order of Chivalry shows how seamlessly his gothic style complemented the page’s borders and typeface designed by Morris. The Ingalls Library at the Cleveland Museum of Art is fortunate to have each of the 53 titles printed by the Kelmscott Press. Morris’s literary masterpiece, The Earthly Paradise, was printed by the press in 1896, the year he died. The epic poem invites the reader to leave behind the grime and noise of modern-day England and become immersed in the author’s dream world, inspired by medieval and classical tales. Morris’s designs and working philosophy combined a vast knowledge of the past with a vision for the future, always inspired by the world around him. 1. William Morris, The Collected Works of William Morris: With Introductions by His Daughter May Morris (Cambridge: Cambridge University Press, 2012), vii. 2. J. W. Mackail, The Life of William Morris, vol. 2 (London: Longmans, Green, 1899), 336.